What makes a good chainset? Which chainsets aren’t suitable for you and your riding? What options are worth considering? All these cranky questions are answered in this guide. Chainsets, or cranksets, are the front section of the drivetrain and although they all look similar and perform the same function, they can be bewilderingly different on closer inspection. Crank length, number of rings, number of teeth, bottom bracket system and manufacturer compatibility and so on. Let’s start by breaking down the chainset into its constituent parts. Most road bikes have two chainrings at the front, known as a ‘double’. Touring bikes or bikes built for long days out in big mountains sometimes have three chainrings up front, known as a ‘triple’. Track and single speed bikes have just one chainring, you’ve already guessed it, known as a single ring. Chainsets are designed as single, double or triple ring and you can’t simply add another ring to make things easier or harder as the fittings are specific to each of the three types. You will also hear the term ‘compact’. Compact chainset is a double ring chainset with fewer chainring teeth on both rings compared to a ‘standard’ chainset. Fewer teeth = lower gearing = easier to climb. Most compact systems have a smaller bolt pattern which means you can only use certain size rings but some new types – such as Shimano Ultegra 6800 – use rings which are compatible with both compact and standard sizes (in 6800 range). Cranks are also available in 4 and 5 arm versions so if replacing rings ensure you have the correct bolt pattern on your rings to match the cranks. 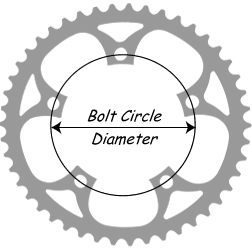 The technical name for bolt pattern is BCD (bolt circle diameter). The lower the number of teeth on a chainring the easier it is to pedal. 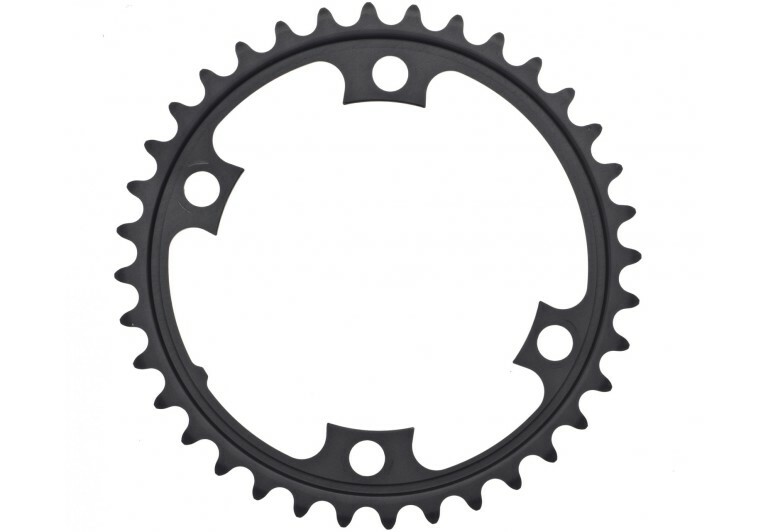 Most standard double chainsets are 39 x 53 (39 teeth on the smaller ring, 53 teeth on the larger ring). The increasingly popular compact versions have 34 x 50 rings. As well compact chainsets making climbing easier, you can also run a low ratio cassette on the rear, with an 11 tooth smallest sprocket, so as to get the same large gear rations as you’d have with a standard. Win-win really. To muddle things a bit(!) 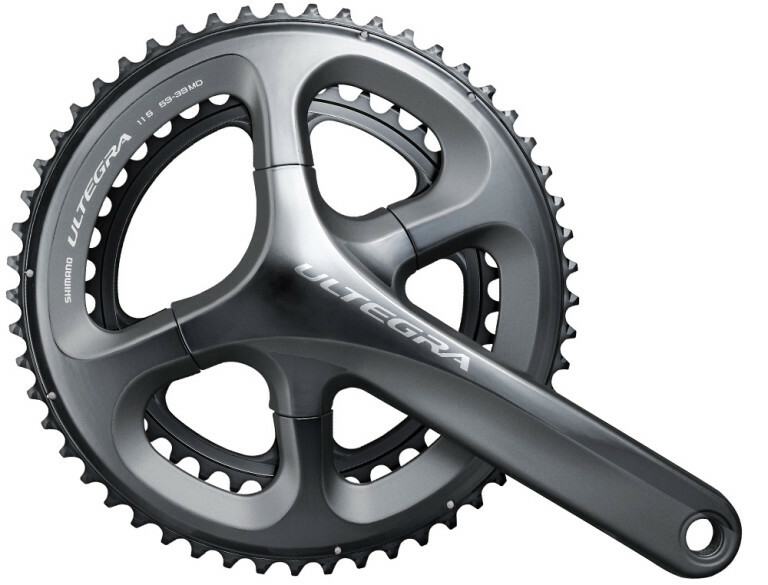 Shimano’s 11 speed 105 and Ultegra groupsets now have 36 x 52 chainset option. This does seem the perfect middle ground and is also becoming increasingly popular. Triple road chainsets usually have a 30 x 40 x 50 ratio. Triples are often used mostly on bikes where carrying loads is common and so a very lower gear is needed. The two crank arms are right and left specific. The right crank arm holds the chainrings and the left just has a pedal on the end of it. 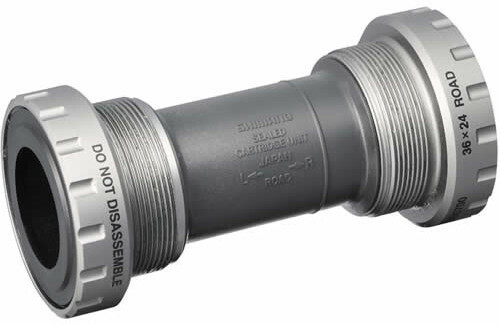 They are connected to each other via the bottom bracket system. The length of the arm can have a significant effect on performance and comfort. Crank arm lengths range from 165mm to 180 mm. Although it doesn’t sound much, a few mm’s difference can really be noticed when you’re pedalling. The options are 165, 170, 172.5, 175 and 180 (although 180 is very rare and usually only used by tall professionals in time trials where they need extra leverage for extra power). Crank length depends on leg length. Those with very short legs would be better off using 165mm cranks. 170mm is pretty standard on bikes up to medium then 172.5 and 175 on large frames. With bottom bracket (BB) systems it has become rather technical of late! But it is necessary to know the difference. Hey, if you are still reading this so far – well done! The most important aspect here is the size of the bottom bracket shell on the frame. This will determine BB/crank compatibility. The most prevalent these days being ‘outboard’ or ‘external’ bearing type on ‘standard’ sized bottom bracket shells. Modern chainsets have the bottom bracket axle attached to the cranks and the bearings sit outside of the frame. There are also several older types such as square taper, ISIS and Octalink which all need a corresponding (and separate to crank arms) BB. Oversize BB systems such as BB30 and BB386 all have an oversize axle attached to the crank, with compatible press fit bearings sitting in the similarly oversized BB shell of the frame. Oversize BBs only work in oversize BB shell-ed frames. If you have a frame with an oversize BB but you wish to use a ‘normal’ chainset then there are solutions available. 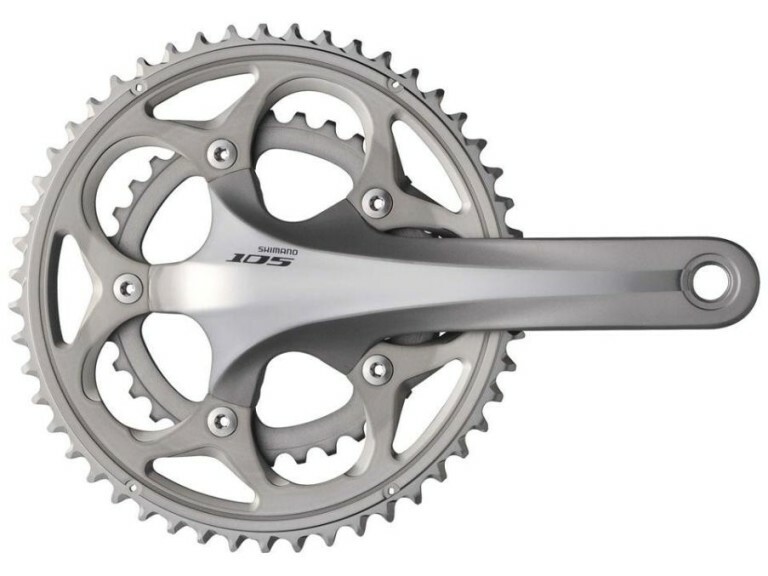 There are a few companies making ‘reducers’ or ‘converters’ for non-oversize chainsets in oversize BB frames. If you just want a straight replacement that’s no problem, just copy what is on your bike, ie manufacturer, groupset, number of teeth and crank length. 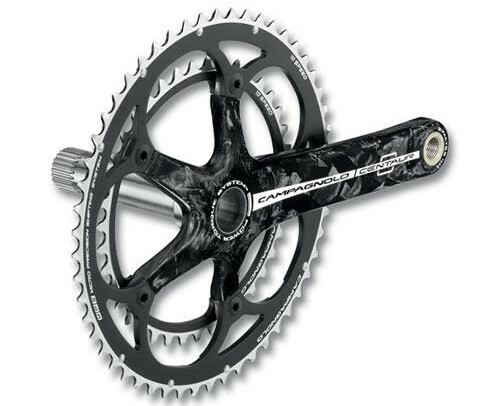 If you have a standard chainset and want lower gearing then get a compact. For more leverage get longer crank arms, usually a benefit for time trials or other similar solo events against the clock. Which road chainset should you buy? Leisure riders should keep an eye on the sales and bag a bargain. Just make sure your chosen chainset is compatible. Chances are you may not have the tools to fit the chainset yourself so please remember to factor in workshop labour too. Regular riders may be looking to upgrade from the chainset that came supplied with their bike. A mid- to high-end chainset will be significantly lighter and stiffer. Almost all riders should consider switching to a compact chainset or a modern 36 x 52 Shimano option. The choice will be between aluminium or carbon crank arms. Your bank balance will dictate which you go for. Racers should look at standard size chainsets (change your cassette if required as the course dictates). Carbon cranks will start to be commonplace in the race pack these days. Failing that, there are also chainsets with built-in Power Meters – such as Stages cranks – which give valuable insight into your wattage performance. Tagged beginners, bottom brackets, buyers guide, chainsets, compact, cranks, crankset, press fit, road chainsets, stages, standard. Bookmark the permalink.